Whether you need us to pack your belongings or you only need supplies, let Discount South Florida Moving help you in any way they can. Properly packing, wrapping, boxing and taping your possessions is a critically important step in the moving process. Our packing services will do it all for you, making your moving experience as easy as possible. Discount South Florida Movers employ professional packers to assist with your packing needs. Even if you only need advice we are here to help. Let us send a packing professional to your house or place of business to give you hints and tips on packing. Learn what you need to know about how to pack, tape, label and secure your belongings so they arrive to their new destination safely. So whether you select our premium packing service for your entire house or just a few select items, we can help you. Discount South Florida Movers offers storage services that are designed to meet the specialized needs of our customers, whether you are storing a few items or an entire room full of furniture. We also provide temporary in transit storage as well as permanent storage for when it is required for longer than a period of ninety days. We offer a wide variety of options so we may customize your storage needs. Household Storage: Our priority is on safe, secure household storage based on our customers request. Many options are available from short term, personal storage to long term and permanent storage. Commercial Storage: Discount South Florida Movers offers commercial storage for all types of properties and businesses. Records Storage: Discount South Florida Movers takes security very seriously when it comes to storing your records and data. Discount South Florida Movers provides temperature controlled storage facilities if needed. Your possessions are safe and secure under the careful watch of our state of the art security system and 24 hour monitoring. 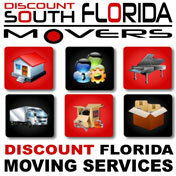 Discount South Florida Movers packing and storage services are designed to meet the specialized needs of our customers.